Smooth and stable, agile and able. This is the skiff that everyone is talking about. Thanks to the Advanced Inverted V hull design, the Pro 17 Skiff CC rides smooth and drafts shallow (just 8"/20 cm), making it ideal for both skinny inshore marshes and rough inland waters. And the rolled gunwales keep you drier at cruising speed. The deck and foam-filled hull are mechanically and chemically bonded to become one unitized structure with superior flotation and quiet operation. And at 17' 4" (5.3 m) long with an 80" (2m) beam, it's incredibly spacious and stable. 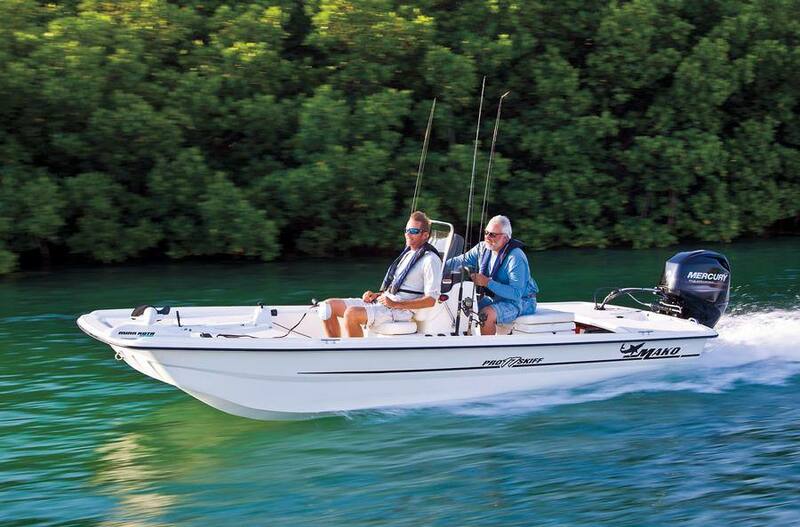 Inside, you'll enjoy 360° of fishability, with huge non-skid casting decks fore and aft. The center console sports rod holders, flush-mount electronics-mounting surface, a contoured acrylic windshield, stainless grab rail, an aerated 8-gal. (30.28 L) livewell, and an 85-qt. (80.44 L) rotomolded cooler under the cushioned seat. New for 2015 is standard 2-tone marine-grade upholstery, 5 hull-wrap color options, stainless steel grab rail options, and an optional Power-Pole® Micro Anchor! The MAKO Pro 17 Skiff comes standard with a hot-dipped galvanized trailer, a 30 HP Mercury 30 ELPT FourStroke outboard, and our MAKO Assurance limited warranty. Approx. package weight: 1849 Lbs. Max. weight capacity: 1400 Lbs. Max. person weight: 850 Lbs. Approx. hull weight: 950 Lbs. Transom height at center line: 20"